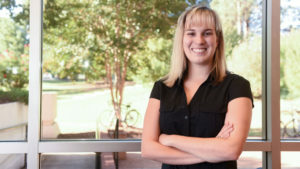 NC State doctoral student Katelyn Brandt works with a team led by Rodolphe Barrangou who conducts CRISPR research at NC State. CRISPR involves a group of molecules which are capable of editing DNA. Vastly different from any other genetic editing attempted, CRISPR is a scientific superstar and scientists are clamoring to create or join labs like the one at State run by Barrangou. CRISPR, a naturally occurring system, is being coopted as a genome editing tool, explains Brandt. Therein lies an enormous difference that has become the passionate focus of scientists here and around the world.